You know how you don’t really know what you are missing out on until you do? Does that make sense? I had NO idea what I was missing out on before I used the Go! Baby Fabric Cutter – and now I am positive I could never make a quilt without one. This machine is amazing! I decided to give it a test run and started out with a Fall Medley Table Runner – Perfect for Autumn and my Fall Fever! I think it turned out so cute and and was so easy to make – thanks to the ease of using the Go! Baby! First – let me show you how easy it is to use the machine. You get it out of the box and open it – and your ready to use it – YES WAY!! That easy!! There are a lot of different dies you can use – I used the 2 1/2” strips and the Fall Medley for my project. Here is am using the strips. First, You cut your material the size of the die you are going to be using. Second, you lay your material on the die. Third, you cover your die and fabric with the cutting mat and lastly, you roll it through – make sure you roll in the direction you want your die to roll. When you are all done – you will have perfect strips! Or perfect, leaves and pumpkins!! Normally, I would have had to trace, and cut all these out by hand – but not anymore!! I seriously cut all these out in a little under 3 minutes! 3 MINUTES PEOPLE!! YAY!!! Then I simply sewed it all together! and a couple more because I am still in awe of how simple it was!! If you haven’t looked into getting an Accuquilt Go! Baby – I would seriously encourage you to do so! Tell your hubby that it’s on your Christmas list and send them over there right now! There are so many things going on right now – click the following link below to download 22 FREE patterns – sweet!! I did and I love them! I cannot wait to try a bunch out! While you are there downloading – you can also click on over to the Go! Baby for this amazing deal! Receive a FREE GO! Die Set with a GO! Baby Fabric Cutter purchase - a $112 value! One (1) free gift per cutter. 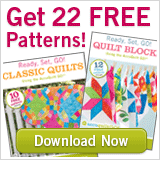 Plus, get2 FREE Patterns! p.s. Disclaimer: I did receive the Go! Baby and a couple dies for review, but the opinions are my own and are totally honest and I really do love this machine!